The heavy shopper bag is extraordinarily popular with retail customers, mostly grocery related, although it's also popular with clients when used a promotional product, because it can distribute loads of heavy items. A generous size combined with a PE baseboard and bracing straps, make it capable of carrying heavy loads - like half a dozen oversized tin cans or a number of bottles of softdrink. Our heavy shopper is different to most of our competitors in that we offer a slightly larger than average 130mm wide print between the straps. 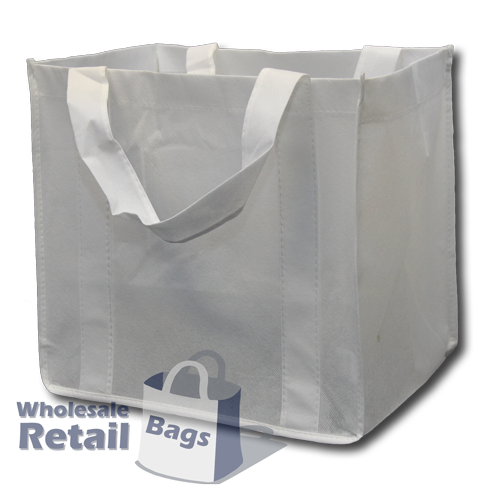 Customers interested in a larger print width should check out our Big Shopper Bag, it does not have the bracing straps so it can fit a much larger print.